Yesterday Christian solved my problem by making this delightful treat. It was easy, practical ,and decadent. All you need is blackberries, sugar, and puff pastry and some orange butter cream to glaze the top. Place the puff pastry on a cookie sheet. 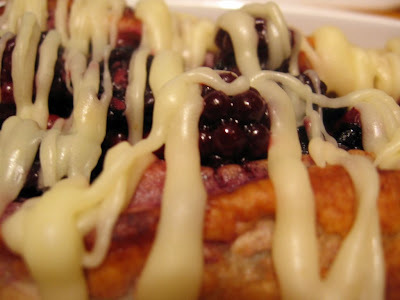 Spread the blackberries on top of the puff pastry. Line them up right in the middle. Sprinkle sugar on top of the blackberries. Fold the sides of the puff pastry so that the sides meet in the middle. Let the puff pastry cool down for about 5 minutes until you glaze with the buttercream. Glaze with butter cream and serve warm with ice cream. I already know what to bake next! Thanks Damaris! Oooo...that sounds DELISH! I'm going to have to try that one while the berries are in season. Thanks!